The Village Square is dedicated to making political engagement (even more) COOL and FUN – and perhaps, not quite so stressful! How else are we going to compete with WWF mud-wrestling on TV every night?! In making decisions about events, our Salt Lake Chapter is committed to focusing on issues of importance to Utahns. Our calendar for the year 2016-2017 is our best attempt to address the issues our Board feels are most important. If you would like to suggest a topic feel free to e-mail us! If you would like more information on any of our upcoming events, including ways to support or sponsor different events, contact us at jacob@old.utah.tothevillagesquare.org. 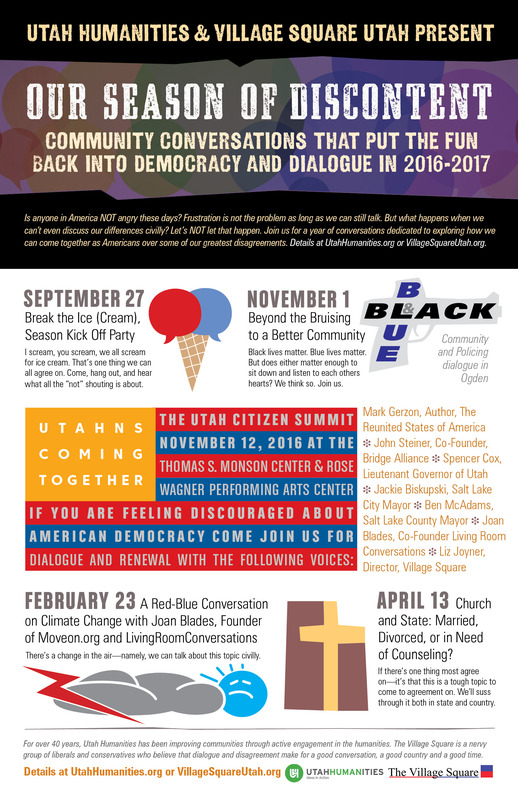 November 1, 2016: Dinner at the Square, “Black and Blue: Beyond the Bruising to a Better Community,” 6:30 – 8:30 PM @ Ogden Union Station-Studio 51. Get detailed information for this event HERE. Register for this event on EventBrite HERE. Evening Gala ~ 7:00 – 9:00 pm @ Rose Wagner Theater for the Performing Arts. Register for Morning Sessions on EventBrite HERE. Register for Evening Gala on EventBrite HERE. June 18, 2015: Dinner at the Square, “Reaching across America’s Deepest Divide,” 6:30 – 9:00 @ Salt Lake Acting Company. Get more information and RSVP for the event HERE. October 8, 2015: Dinner at the Square, “The Secular Religious Divide: Explore how the religious secular divide can yield a more generous conversation” Click here for more information.